While I've come to appreciate some non-luggged methods of frame construction and have even discovered a bike that I truly think looks better without lugs (the truss frame), overall my infatuation with lugwork shows no signs of subsiding. I can go into a meditative trance whilst following the seemingly chaotic yet magically harmonious outlines of a Nervex lug (above) and I can experience a dizzying sense of exhilaration at the sight of a particularly intriguing seat cluster (below). Granted, it's kind of insane to feel so strongly about lugwork - but also perfectly normal for someone involved in art and design. After all, if designers and artists did not feel an obsessive emotional attachment to forms, colours and textures, what would motivate them to create new work? I don't see myself as a hands-on framebuilder, but I think that my dream "bike job" would be to work with a framebuilder as a designer - not only of overall frame specs, but of the lugwork itself. Some framebuilders make proprietary lugs from scratch, while others take pre-fab lugs and alter them beyond recognition - so it's possible to find someone to work with in that context. Some day. But back to lugs... As with everything, those who are into lugwork tend to have their preferences. For instance, for some it's "the fancier, the better," and their "holy grail" is the type of truly elaborate lugwork you might see on Hetchins frames. Some like their lugs chromed, or painted a contrasting colour to the frame. Some prefer "pointy" lugs, while others prefer "rounded" ones. Many customers ordering custom frames ask for something personal or symbolic to be carved into at least some of the lugs, like a shamrock or a star of David. And others still might favour a particular manufacturer, preferring the distinct looks of Nervex lugs, Capella lugs, or Mercian's Vincitore lugs (above). To my eye, lugwork looks best when it complements - but does not overwhelm - the overall form and "personality" of the bicycle frame. For that reason, I am actually not a fan of some of the fancier lugwork out there - to the extent that if someone were to give me a Hetchins with one of the elaborate lug patterns, I would sell it; it really does nothing for me aesthetically. To me, a bicycle frame is ultimately about the form of the frame itself, and I think that overly ornate lugwork competes with that. If the eye is continuously drawn to the joints of the tubes, that interferes with being able to take in the overall aesthetic - which is not something I'd want to happen if I were designing a bicycle. For the same reason, it does not appeal to me when lugwork contrasts dramatically with the main frame colour: For instance, chromed or white lugs on a black or a deep red frame. Close up, the effect is beautiful, but it just does not work for me as an overall design when looking at the complete bike as a whole. I do have my favourite design elements, such as double-plate fork crowns (above), elegant seat clusters, and main lugs with a filigreed look to them. But inasmuch as possible, I prefer for these elements to be noticeable only upon close inspection, so that when looking at the bicycle as a whole, the overall form is what dominates. Oh, and when it comes to utilitarian transportation bikes? 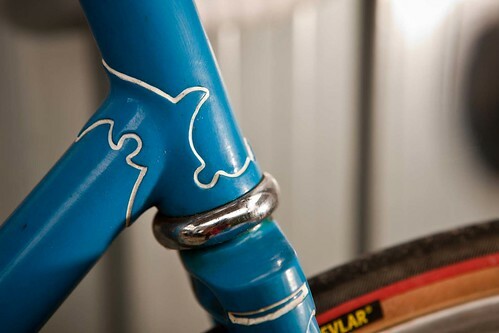 The "jagged broken pipe" look of the old Raleigh Sports lugwork is just fine with me - the simpler the better. What are your preferences? - if you like lugs at all, that is! Do you have a "dream lugwork" in mind if you had the choice, or would you leave it up to the framebuilder? I actually prefer far more simple lug work. Maybe I'm a function over form kind of person but sometimes lugs can see a little frilly and excessive to me. That is about as ornate as I like. If I could afford a Mercian Vincitore Speciale, I'd be tempted to buy one, but it does not look like the pound will sink low enough any time soon. The frame-builder app on their web site is a dangerous thing to play with. I don't think fancier lugwork necessarily interferes with the personality of the bike--it is part of it. Does the whole package match the personality of the rider, that is the question. I'm fairly conservative when it comes to lugwork-- much like you. I wouldn't like a Hetchins with the overly ornate lugs. But I do like lugs that are hand-filed and thinned, so that they almost disappear into the tubing, rather than lugs that have a continuous thick shoreline. JP Weigle beautifully thins his lugs, and his are pretty much my personal benchmark for what pretty, understated lugwork should look like. I also like it when very nicely finished lugs aren't outlined-- the outlining masks the artful blending of a well-thinned lug into the tubing, and creates a contrast. On the other hand, for unthinned lugs or lugs that have been poorly filed, outlining can hide those imperfections and enhance the overall look. But JP Weigle's lugwork is probably the nicest in my book. Never overstated, never detracts from the flow of the frame. Moopheus - The frames can be gotten for around 850 GBP now if you don't want any extra add ons, which is $1360 USD. That's less than most Rivendell frames! I almost always like Peter Weigle's use of lugwork. He uses Pacenti lugs a lot - which makes me wonder what will happen now, since (as I understand it) Pacenti is selling the business. I did not know about Pacenti selling the business. Weigle also uses Nervex lugs, an I'm not sure what else he uses. I also happen to like Henry James investment cast lugs. I don't think I mind super fancy lugs! If I were to pick a style, it would be "pointy" with a medieval feel. I like longer, sharp edges for lugs as opposed to curly, more organic shapes. One thing I'm finding to be bothersome is a high contrast between lug color outling and frame color, like on that red framed bicycle above. I think it is more elegant to not outline or fill in lugs*, like on your Bella Ciao. I agree with what you said about ornate lugs distracting from the frame, but I think if the fancy lugs are not heavily outlined, it would not be as distracting? 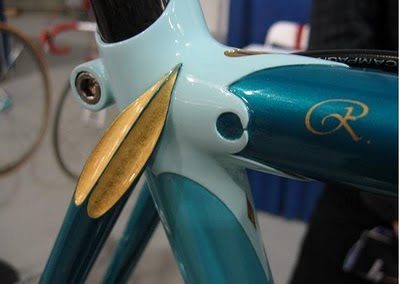 * I think metallic outlines like on your custom mixte and on the Gazelle work a lot better than non-metallics, to my eye. The problem with using Nervex lugs, is that they are bound to run out, since thy are no longer produced, so it's not a sustainable plan for a framebuilder to rely on their availability (unless he has hoarded hundreds of lugsets?). As an engineer I prefer lugs simply because they strengthen the frame at critical stress points. As a cyclist I prefer lugs for the bling they add to any bike. Walt - but do they really? Supposedly that is no longer the case, given modern TIG-welding and fillet brazing technologies. What are your thoughts on that? Nervex lugs may be getting harder to find, but Richard Sachs still sells Newvex lugsets. I think lugs are beautiful and I've had a few frames with very modest lugs, but my favorite joinery method, aesthetically, is fillet brazing. Nice TIG work on TI isn't hard to look at, either. I was listening to a talkshow on mathematics the otherday. One of the guests, a specialsit in one of the more theoretical divisions of mathematics (pun intended) said that he, as most do, found math beautiful. When the host asked him to elaborate, he said what one of his studends had said; "the definition for beauty is "unexpected simplicity"". Really liked that definition. Allthough I have trained my eye to admire more baroque designs. My main interest is fine guns, and that field is full of design and art! Btw, that double plate fork crown is the best Ive seen ever! Tru art! double plated fork crowns are the absolute best!!!!!! "Richard Sachs still sells Newvex lugsets"
I forgot to mention that the Newvex lugs are for oversized tubing; I bet that you'd notice that and have probably not confused the two. M.Pewthers - Oh, I see. 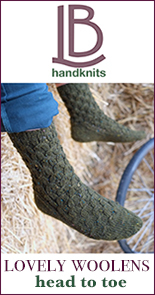 Not a fan of oversized tubing, but it's nice that there is an option for beautiful lugwork for those who do like it. "Walt - but do they really? Supposedly that is no longer the case, given modern TIG-welding and fillet brazing technologies. What are your thoughts on that?" 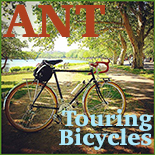 "From the late 19th century until the 1970s, this method of frame construction was favored because the lower temperatures of brazing (silver brazing in particular) had less of a negative impact on the tubing strength than high temperature welding, which can seriously weaken many steel alloys. Brazing thus allowed relatively thin walled, lightweight tubes to be used without loss of strength. However, recent advances in metallurgy have created steel tubing that is not adversely affected (or may even be improved) by high temperature welding. This has allowed both TIG and MIG welding to displace lugged steel construction, in large part because these methods lend themselves more easily to automation and reduce the cost by eliminating the lugs." Welding offers the chance to burn though or crystallize the joint in a hidden fashion which on thin bicycle tube isn't good at all. Brazing allows the joint to flex ever so slightly which reduces shock impacts greatly giving a bit of extra spring to the frame not available otherwise. All that said, Custom builders know these hidden advantages of brazing as well as the dangers of welding which is why ,IMO, they almost to the man prefer brazed lugs over TIG welds. TIG welds benefit mass frame producers since they can be machine done where brazing can't easily be machine done. It's all about cost to a maker whereas it's all about quality with the custom maker. They have been building them that way for over 100 years. Velouria, I like that you like the Truss frame. I love it so much I have one on order. I have had many bikes in my lifetime, this is one that I actually dream about getting and riding. Ahh, those warm days to come (temp is currently 12° out!). Dave - I am getting one myself in the future, it's just a matter of when. I keep saying that I like Mike's work, so I think it's time to prove it : ) When will yours be ready? Walt - From what I've seen, it seems to me that custom builders today are lugged/non-lugged 50/50. And the ones that use TIG-welding do seem to believe that brazing is no longer superior. I keep hearing both points of view, but do not understand enough on this topic to form a real opinion. Perhaps with time I will. I have seen lugged cruisers in Europe. Do you think they are American imports? I wish I'd paid closer attention now. "I have seen lugged cruisers in Europe. Do you think they are American imports? I wish I'd paid closer attention now." Yes, you may have and the cruisers you saw very well could have been Workman since they export worldwide. It's as I said, to the best of my knowledge Worksman produces the only lugged cruiser today for mainly the industrial market. Nothing stands still so one only has to hope that the maker is choosing the best method for their product line. It's as I said, one will aid in ride qualities where the other will not so it's really what the maker was shooting for with that frame design. It's very much like the aluminum vs steel frame discussion since they each bring different features to the table. The fact that i already have 4 vintage lugged frames around the house, however, makes me think that, when i get a nice new bike, it'd need something to make it stand out from the fujis and miyatas, which makes the vincitore more appealing. Then, i remember the pro lugless, with the sleek fillet brazing. To the cute remark above about a preference for fillet brazing being a precursor to carbon fiber addiction, i simply remind folks that the oldest mercian in existence is a fillet brazed model. walt D's quote of wikipedia is helpful, but it lacks mention of air-hardened steel alloys, which get stronger at the joint with welding. Further, we need to remember that fillet brazing doesn't involve welding, either. It can be rather heavy, though. Velouria, I'm hoping in March for my Truss bike, I ordered it last August. My wife, Daughter and I visited a museum show in NYC last summer, that's when I layed my eyes on Mikes bikes for the first time and had to get one. I think it was the black frame, red rims and cream tires - just killer. It looks like a modern antique. I can't wait!! rob - I've been looking at Mercian for the past year and a half or so. They used to offer a twin stay mixte, and a coupe of acquaintances enthusiastically recommended it to me when I was looking for one. Of course at that exact time, Mercian discontinued it and replaced it with the single tube step through model. Interestingly, I also initially thought the Vincitore lugs were too ornate, but grew to like them over time. And if I were to get a Mercian, it would definitely be a Vincitore - because I think the price is worth it considering that you're getting *hand made* proprietary lugwork. That lugset has been in continuous production, by Mercian only, since the '60s, which to me is very exciting. And while I couldn't care less what the people in the coffee shop think of my bike, for me that sort of thing is meaningful. I'm in love with the ornate lugs. Unfortunately, all of my bikes have the utilitarian, Raleigh lugs but it's fun to consider the alternatives. For example, those "Franklin Mint" chrome floral lugs that Mike McLennan posted are some of the most beautiful things I've ever seen. Given that so much of what I deal with on a daily basis from cars to utinsils to appliances are all geared towards simplicity and utility over beauty, sometimes it's just nice to see something made intentionally beautiful, even if it is ultimately unnecessary for the function of the bicycle. I Love lugged steel bikes. I like all of the ones you have in the photos although there are a couple/few that I really like. I don't think I would want a bike without lugs. Many of those lugs look as if they're from the Rococo Period. I tend to prefer lugs that are a little more understated and utilitarian. But would anybody in their right mind turn down a Hetchins or Mercian frame if it came their way? 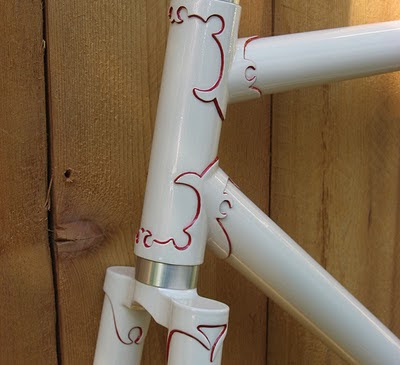 By happenstance I have been reading about Tom Ritchey's fillet brazed mountain bike frames from the early 80s. A completely different aesthetic, but they're quite elegant in their own way and perhaps underappreciated. MT cyclist - Yes, I honestly would turn a Hetchins away if the condition of it being given to me was that I had to keep it (as opposed to being able to sell it or give it away). I don't see the sense in owning things that I am not passionate about but would make someone else very happy. I still think that the pictures you posted of the rear triangle on your custom mixte are a fantastic example of the little details! 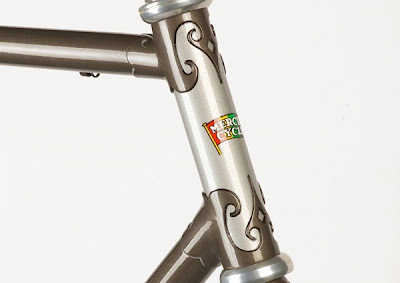 No love for the mercian pro lugless, or the beautiful fillet-brazed frames on offer from bilenky, engin, curtlo, and many others? The seamless look is, to my eye, very appealing. As for the hetchins, esp the curly stay ones: they have their appeal, but I'm as likely to wear a tutu as i am to ride one of those. rob - Of all the new Miss Mercians I know of, none have the supporting stays. But I would be surprised if customers intentionally "opt out" of that version. It's more likely that Mercian planned to offer it, but it turned out not to be feasible. Maybe I'll ask them. The older twin stay version is no longer possible, that I know from having asked myself. They ran out of the lugs necessary to make these and did not produce a new batch (probably because there was not sufficient demand to justify it). Though they probably could handmake just one set of lugs specifically for a single bike, the cost of doing that would be higher than customers were willing to pay. In any case, their answer to me in the summer 2009 was "no, we can't do that anymore." I love that! I've always wondered about the lugwork on my Raleighs and until I had several, thought I'd somehow got one made by a crew in Nottingham that had enjoyed too many pints with lunch. When I first started cycling, the best bikes had Nervex lugs. They are like the ones in the first photo and on the white frame with the red pinstriping. Then, the long-point Italian-style lugs came into favor. Fancy lugs all but disappeared. Can you imagine Nervex lugs with one of those awful 80's paintjobs? That question brings me to my point: The care that goes into the lugwork matters more than what kind it is. I'd rather see clean "gaspipe" lugs than fancy ones with sloppy work. I think that the lugs, paintjob and overall bike design should complement each other. Ditto for non-lugged frames: The way the frame is joined together should reflect, above all, good craft and attention to detail. For years, I rode a very nice fillet-brazed frame. It also had a fancy paintjob, so I think fancy lugwork would have been a bit much. I got my Miss Mercian in August. I chose it even though it doesn't have the twin laterals because, given my experience with the other two Mercians I ride, I trust their designs and workmanship. Happily, the ride of the bike is up to what my other Mercians offer. When I asked, they told me that not only the lugs, but also the stays for the twin laterals, are no longer made. 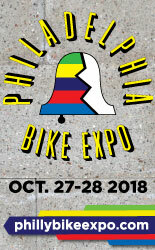 They said that those builders who make bikes that way are either making their own tubes and lugs for the purpose or are having some small company make them. As Australia Day is 2 days away, I must whisper this name in your lugs: Darrell McCulloch, NAHBS champion lug maker, based in Australia. behoovingmoving - Thanks, his work looks beautiful! 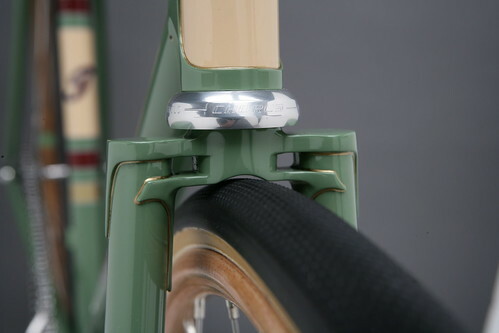 I especially like his solution to making the lug spacing on a small frame look elegant (here). Thank You so much for using the photo of one of my bikes in your article. I lean towards more understated designs but every once in a while it's fun to go wild. 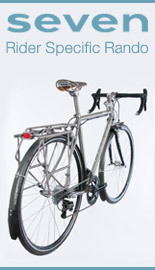 My favourite lug is the Prugnat I style and that's what I was using as inspiration with the Pacenti's on that bike. I love your blog! You cant imagine my surprise to be scrolling down the page and see the Nervex lugs of my 1959 W & E Pollard track bike! (the first one pictured in this blog). Stay warm out there! MT cyclist: "But would anybody in their right mind turn down a Hetchins or Mercian frame if it came their way?" I'm living proof as regards this comment. I've always loved lugs but rather disdained (in a modernist straight-line kinda way) of the curly hetchins ones. Then, after my old road bike was stolen, I stumbled across a neglected and discarded Vincitore special frame for a song and simply couldnt walk away. I dressed it up in subtle modern mono-tone colours and gear to try and play down the baroque aspects that are just not my style... and now after many months I've come to love my "hand-carved" lugs. But if I ever do get a repaint, I think I'll probably get a one-tone throughout respray and outline the lugs in a very subtle dark grey-silver. What particularly converted me to the lugs was randomnly running into one of the last remaining long retired lug-cutters in England. He used to work for Claud Butler amongst others and cut many a spectacular nervex lug. After speaking to him I had a whole new perspective on this labour intensive art-form that was based on a select group of working class artisans. Love all the gorgeous bike photos... keep it up.